I’ve met representatives of the California Board of Barbering and Cosmetology several times, and I’m pleased that the board members seem genuinely interested in keeping California nail salons from getting fined during inspections. 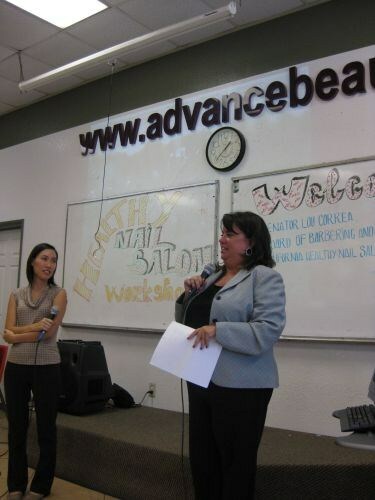 To that end, at a recent “Healthy Nail Salon” workshop at Advance Beauty College in Garden Grove, Calif., Kristy Underwood, the board’s executive officer, shared some of the commonly-overlooked little things that frequently earn salons fines. Some of these are things you normally wouldn’t even think to worry about (like leaving an orangewood stick in a wax pot), but can actually get you a fine if an inspector happens to visit your salon that day. Obvious violation: Unlicensed activity. Not-so-obvious: In addition to nail tech licenses, the salon itself has to have an establishment license, which has to have the current (not a former) owner’s name on it. Obvious violation: Disinfectant not changed and/or covered. Not-so-obvious: This means the lid has to always be on top and fully closed. Also (sort of obvious), there shouldn’t be any debris floating in it. Obvious violation: Not storing disinfected and soiled non-electrical instruments in properly labeled containers, labeled “clean” and “dirty”, respectively. Not-so-obvious: This means you! Regardless of how long you’ve been in the industry, or if you personally know which container is which, by California law, the containers have to be labeled. Oh, and no fingernail clippings in the “clean” container (would think that part would be obvious, but Kristy says the inspectors see it all the time). Obvious violation: Liquids, creams, powders and cosmetics not in clean and/or closed containers. Not-so-obvious: The wax pot has to be closed all the way. There can’t be an orangewood stick sticking out of the lid and the lid can’t be partially open or totally off when not in use. Obvious violation: Liquids, creams, powders, and cosmetics not properly labeled. Not-so-obvious: This includes spray water bottles; the bottle has to say “water” on the somewhere. Kristy says to just label everything in the salon to avoid a possible fine. Make sure to check yourselves! The California state board has made a printable PDF of some of these violations on its website; you can access it here. Kristy also says the board is trying to rewrite its violations in simpler terms to make them easier to understand. Have any of you ever been cited for one of the “little things”? Did you pay the fine, appeal it, or something else?